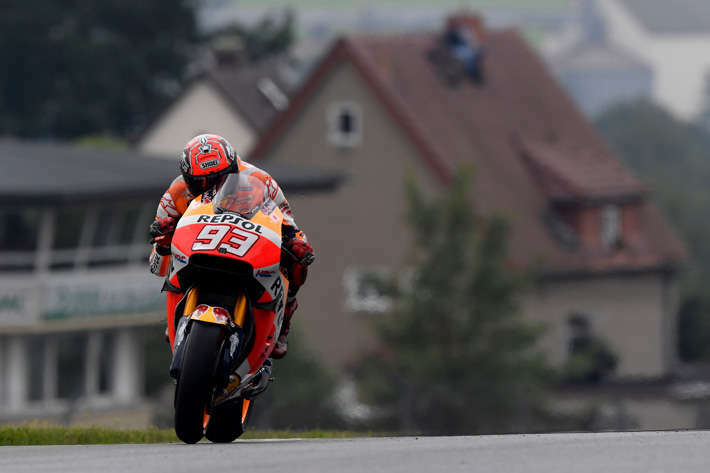 Marc Marquez (Repsol Honda RC213V) achieved a historic result in today’s soaking German Grand Prix, scoring a unique seventh consecutive victory at the Sachsenring across three categories: 125cc, Moto2 and MotoGP. To complete Honda’s joy in this most enthralling of races, Cal Crutchlow (LCR Honda RC213V) finished a superb second to make it a Honda one-two. Both Marquez and Crutchlow were delighted with their results. Marquez’s third win of the year doubled his championship lead at the halfway stage to 48 points over reigning champion Jorge Lorenzo (Yamaha) who could only manage a 15-place finish this afternoon. Meanwhile Crutchlow was ecstatic with his first podium since last year’s Argentine GP, just a few weeks before he and his wife Lucy are expecting their first child. Marquez, who suffered a high-speed spill in morning warm-up, could hardly have achieved his 53rd career victory in more treacherous and challenging conditions. The race started on a soaking track but by half-distance a dry line appeared at certain parts of the circuit. Marquez was the first rider to enter the pits and change to a bike fitted with full slicks. This was a brave and risky decision because the track was still damp in many places, which made it very difficult to work enough heat into his slick tires. But the 23-year-old’s spectacularly aggressive riding style soon had his slicks up to temperature and he became the fastest rider on track, catching the leading group, who were still using rain tires, at the rate of six seconds a lap! So his decision to change bikes turned out to be inspired, but it was anything but an easy decision when he took it. Most of the leading group did finally enter the pits to change bikes and tires – some to intermediates, some to slicks (including Crutchlow) – which left Marquez with only one rider ahead of him: last month’s Dutch TT winner Jack Miller (EG 0,0 Marc VDS Honda RC213V). Marquez quickly swept past the Australian and was soon well ahead, while the battle for the runner-up finish waged between Crutchlow and Andrea Dovizioso (Ducati), who had led much of the earlier stages. The Briton pounced on the Italian at the final corner with two laps remaining and then established himself in second place. Dani Pedrosa (Repsol Honda RC213V) had high hopes of a great race after topping this morning’s rain-affected morning warm-up session. However, a challenging qualifying session had put the 30-year-old Spaniard tenth on the grid, so it wasn’t easy for him to fight his way through the pack. At one stage it seemed like he might have a shot at the podium but it didn’t quite work out like that and he ended the race in sixth place, a fraction ahead of Miller and Valentino Rossi (Yamaha). Former Moto2 World Champion Tito Rabat (EG 0,0 Marc VDS Honda RC213V) made a good call when he changed tires and was aiming for a top-ten finish until he slid off. Johann Zarco (Ajo Motorsport Kalex) scored a brilliant victory in the rain-soaked Moto2 race, fighting off an all-or-nothing attack from local-hero Jonas Folger (Dynavolt Intact GP Kalex) at the final corner. Zarco’s winning advantage was just six hundredths of a seconds but the 25 points he won for his fourth success of the season are a huge bonus for the reigning champion and current World Championship leader. The ninth race of the Moto2 campaign was most notable for the number of riders who fell victim to the treacherously slippery track, several of them sliding off and remounting, only to slide off again. Just 15 of the original 27starters finished the race. The most significant faller was Alex Rins (Paginas Amarillas HP 40 Kalex) who had been equal on points with Zarco before this race, until he crashed out in the closing stages. Sam Lowes (Federal Oil Gresini Moto2 Kalex), who had been just five points behind Zarco and Rins, fell twice. Third finisher in the Honda-powered Moto2 race was Julian Simon (QMMF Racing Team Speed Up), who crossed the finish line 20 seconds down on Zarco for his first podium result since 2012. Mattia Pasini (Italtrans Racing Team Kalex), another class veteran, came home in fourth place ten seconds behind Simon and just over a second ahead of Lorenzo Baldassarri (Forward Team Kalex), who rode a hero’s race after dislocating a shoulder in this morning’s warm-up session. Rookie Luca Marini (Forward Team Kalex), Rossi’s half-brother, braved the conditions well to follow Baldassarri home in sixth place, his best Grand Prix result. The top ten was completed by Hafizh Syahrin (Petronas Raceline Malaysia Kalex), Jesko Raffin (Sports-Millions-EMWE-SAG Kalex) and Isaac Vinales (Tech 3 Racing Tech3). The first race of the day started in very wet conditions, with the Moto3 pack splashing its way through torrential rain. The 27-lap outing soon became a duel between team-mates Khairul Idham Pawi (Honda Team Asia Honda NSF250RW) and Hiroki Ono (Honda Team Asia Honda NSF250RW), until Ono ran off the track in his efforts to keep up with the leader. He later crashed out. That left rookie Pawi all alone, way ahead of the opposition. The 17-year-old from Perak, north of Kuala Lumpur, finally crossed the finish line 11 seconds ahead of Andrea Locatelli (KTM), with Enea Bastianini (Gresini Racing Moto3 Honda NSF250RW) making it two Hondas on the podium with a third-place finish, two seconds behind Locatelli. This is Pawi’s second runaway win in wet conditions, following his dominant performance in April’s Argentine GP. The Malaysian youngster worked his way into Grand Prix racing through the Malaysian, Asian and European scenes. He has ridden Honda machinery throughout his career, from national ‘underbone’ racing, to the Asia Dream Cup and FIM CEV Moto3 Junior World Championship. Jakub Kornfeil (Drive M7 SIC Racing Team Honda NSF250RW) and Fabio Di Giannantonio (Gresini Racing Moto3 Honda NSF250RW) were fourth and fifth to make it four Hondas in the top five. Jorge Navarro (Estrella Galicia 0,0 Honda NSF250RW) rode a hero’s race, just weeks after breaking a leg in a training accident, fighting his way to a superb seventh-place finish, which means he took one point out of the points lead held by eighth-placed Brad Binder (KTM). Jules Danilo (Ongetta-Rivacold Honda NSF250RW) completed the top nine. Niccolo Antonelli (Ongetta-Rivacold Honda NSF250RW) was unable to race after breaking a collarbone during yesterday’s qualifying session. The MotoGP circus now embarks on its summer break, reconvening in Austria at the Red Bull Ring over the weekend of August 13/13/14.